KIEV, Ukraine -- Ukraine is fighting a war on two fronts. The one you see on television is taking place in the east of our country, where thousands of Russian troops are engaged in an armed aggression against Ukraine’s territorial integrity, including the illegal annexation of Crimea. 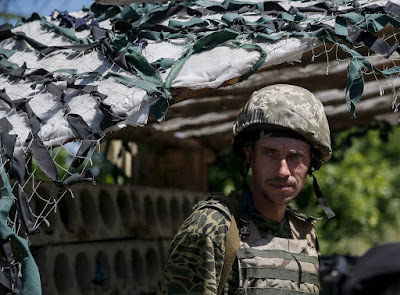 A Ukrainian serviceman is seen at a checkpoint at the frontline with pro-Russian separatists in Novotoshkivske, eastern Ukraine, on June 8. Less visible, but just as important, is Ukraine’s war against the Soviet past and the legacy of corruption and misrule that has held us back for so many years. These battles must be fought and won together because they are essentially about the same thing — Ukraine’s desire to build a prosperous and democratic future. Russian President Vladi­mir Putin wants us to fail because he knows that democratic ideas are contagious and that a free Ukraine would set an unwelcome example at home. Russia’s military intervention is an attempt to prevent change by forcing us to choose between security and reform. Ukrainians are united in rejecting this choice. We know that the only way to regain control over our future is to create a modern Western society based on accountable government, a free-market economy and rule of law. Instead of slowing the pace of political and economic change, we are accelerating it. Many landmark reforms have already been implemented. We have ensured severe budget discipline and started full-scale economic deregulation to cut away the jungle of red tape that stifles enterprise and enables corruption. We are removing the distorting influence of business tycoons in economic and public life. We have delegated financial authority to local communities, which are closer to our citizens. Our tough decision to impose large domestic gas tariffs will simultaneously remove a main avenue of corruption, increase efficiency, boost domestic production and reduce the need for Russian imports. We have initiated a wave of corruption investigations and arrests, including against senior state officials. We significantly reduced the civil service workforce. The tax system is being simplified to encourage investment and reduce fraud. And these are just the headlines of a much bigger program. Responsibility for seeing these reforms through lies with Ukraine alone. But we need the support of our partners to help us stabilize our economy and deter further Russian aggression while we carry them out. We are grateful for the help we have already received. We would not have been able to stabilize our financial position without the International Monetary Fund program agreed to in February. We will need more support in the form of U.S. bilateral aid, technical assistance, private investment and leadership within international financial institutions. We also need international sanctions on Russia to remain in place until the Minsk Agreement has been fully implemented. No one should have any doubt what is at stake. The great achievement of a “Europe whole and free” that marked the end of the Cold War is under direct attack from resurgent Russian authoritarianism and imperialism. Ukraine is bearing the brunt of that attack, but the consequences of allowing our independence to be crushed would not be contained within Ukraine. It would give rise to new threats and crises that would be even more difficult and costly to resolve. The democratic idea itself would be undermined. Together, we can prevent that. With our firm commitment to reform and the support of our partners, we can fulfill the dreams of our nation for freedom and prosperity. Democracy is the most powerful idea ever conceived and never more so than when democratic nations stand shoulder to shoulder. That has been the lesson of U.S. leadership over the past century. It remains our inspiration today.